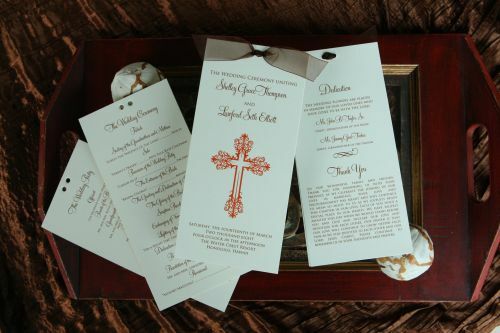 You may have seen our 10 Reasons Why You Need Wedding Programs post earlier this week. One of the reasons is that wedding programs give you a great opportunity to thank your guests, special people who help you with the ceremony or just anyone else important in your lives. But when thinking of what to say exactly, some couples find themselves at a loss for words. So we’ve compiled a few examples of what other couples have done with their wedding programs. We are so blessed to celebrate our special day with each of you! Thank you for your love, prayers and support. Thank you so much to our family and friends, and especially our parents, for sharing this important day with us and supporting us every step of the way! Thank you to our family and friends for choosing to celebrate this day with us: Thank you for honoring us with your presence and love! First we would like to give thanks to God for blessing us with each other. Thank you to our parents who have taught us the true meaning of love and commitment. We are who we are today because of you. You are appreciated more than you will ever know, and we love you very much. Thank you to our family and friends. We are so happy we could share this special day with you, and we are truly blessed to be surrounded with so much love and support. With heartfelt gratitude…Thank you all for celebrating with us today as we begin our life together as husband and wife. We feel truly blessed to have our family and friends here with us on this, the most exciting day of our lives. We are especially grateful to our families, whose love, guidance, and generosity have given us constant support throughout our lives. We have waited with much anticipation for this day to arrive and we are honored to share these moments with our friends and family. We would like to express our gratitude to our parents for their love and guidance. Thank you for bringing us to this day. We have learned love from you and hope in our marriage to always return that love to those around us. To our parents…Thank you for your unconditional love and support throughout our lives. Thank you for raising us to be strong, independent, and loving people. We look forward to sharing the values you’ve taught us with generations to come. To our friends and family…Thank you to all for sharing this incredible day with us. We feel blessed to have so many loyal friends in our lives. We would like to extend a special appreciation to all of our guests who traveled from out of town to be here with us today. There really is no one way to say thank you, but hopefully these examples will help you find your own words to express your gratitude.